Sarah Cooks: Malaysian Food #2 "The Satay Man Can!" 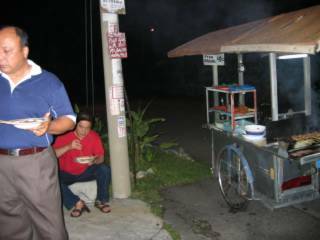 Malaysian Food #2 "The Satay Man Can!" 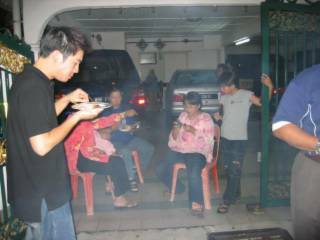 One of the first, most exciting things we did was have satay at my Aunty Rainy’s house in Kuala Lumpur. Her husband, Uncle Roy, is a Datuk (a lord) and she is a Datin (a lady)! They are Muslims, which is great for me because I don’t eat pork! They have a huge extended family – children, grandchildren, great-grandchildren and so on – and thus their house always has a wonderful, homey and comfortable feeling. The children are so supercute! 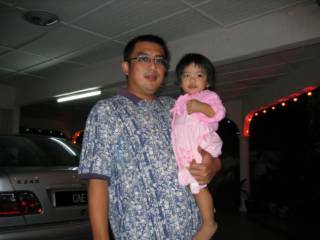 My cousin and his daughter. Whatta cutie! 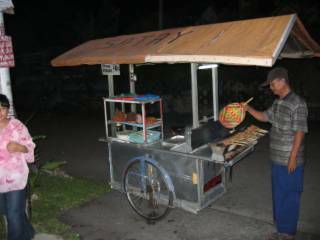 Anyway, on to the Satay Man. 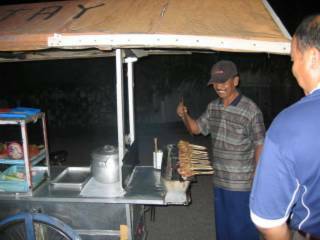 I think that the concept of the “Satay Man” is foreign to Australians. 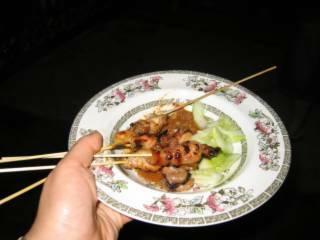 And by the way, if you don’t know what satay is, it is Malaysian style skewered chargrilled meat. And shame on you for not knowing! So, when Aunty Rainy wants satay, she calls the satay man, and he comes around to her house with his cart and grills up a storm of chicken and beef satays. They are served with loads of peanut gravy, cucumber, red onions and these rice square things (cooked rice formed into cube shapes). The atmosphere was amazing! Just all of us standing around at her gates, talking and eating loads and loads of the most delicious, tender, chewy, juicy, charred satay ever! The wonderfully inviting smoky smell just wafts through the air and lets everyone around know that we are eating satay. It’s quite scary the amount of satay that can be eaten in one sitting. 20 sticks is practically NOTHING. Malaysian food #1 "Roti Canai"